The first few seconds of this video from Norway are shocking. Does anyone but me not understand that coniferous trees should be densely covered in green needles, not transparent? The trunk looks just like the trunks in New Jersey, where the bark is falling off, exposing raw, red wood. How can people not see this? The world has gone insane - it is as though we are all living like Norman Bates in Psycho, our mummified mother propped up in the rocking chair, while we continue talking to her, pretending she is still alive. Or equally as ominous, they're pod people like in Invasion of The Body Snatchers. These movies are great metaphor, but some days I truly wonder if there's not some truth to it....seriously. They just don't pay that much attention, and the change is still relatively slow (takes many of these trees at least a few years to die) for their day to day perceptions to take note. The intentional daily onslaught of mundane distractions helps immensely in keeping them from noticing anything of real importance. I was forced to watch an episode of Lancelot Link yesterday. Filmed in California in the late 60s, anyone can readily see the changes to vegetation you are describing. Instead of taking you there, I googled 'pine trees 1950' and the first hit shows your point very clearly. Around here, pine trees looked like these until about 20 years ago. Foresters blame pine bark infestation for the change, but what gave the beetles such a big boost? They've been around as long as pine trees. Old movies and photos tell the truth. 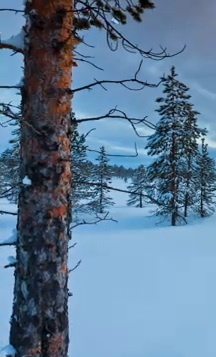 I've got a frame from Dr. Zhivago Trailer (0:47), which was filmed out west or in the Canadian Rockies and it shows the same lush, rich green pine needle foliage that's really hard to find anywhere today. Many old movies and photos are really strong evidence for your arguments, a resource that's waiting. catman, here it is, at 0.46. Lush and full before the apocalypse. Here's a sad photo on pine decline in the Northwest and an accompanying article. No where in the article does it mention ozone as a contributor. It proves Gail's point and my point. Climate gets the stage. Pollution is overlooked. The Environment continues to suffer. "Four years later, the affected acreage is in the millions, and a bearded Twitchell crisscrosses North Routt County in his state pickup." That tells you all you need to know about why foresters don't want to look at ozone as the underlying cause! I like the idea from M.O. and Catman to compare old movie footage. There are so many clips now on the intertubes. I'm going to start with Last of the Mohicans, which Mike Roddy told me was filmed in one of the last standing old growth forests in the US. That should keep me busy! Checking my sometimes imperfect memory at Wiki, I shuddered to discover that most of the movie was made in Spain and Finland, but the "winter scenes of the family travelling to Yuriatin by rail were filmed in Canada" (at 0:46 of the trailer). Hollywood couldn't fully utilize 'on location' production then and the Soviet Union was off limits anyhow. Oh boy! We're going to the movies! Movies used to have such beautiful scenery and Technicolor back in the 40s, 50s, 60s and 70s. But they don't make worlds like that anymore. So true, catman, so true, Panorama during the 50's and 60's was an important part of film making, now it's predominantly close-ups mixed with computer generated backgrounds. Still, there are some the gems to be found. We recently viewed a half decent movie entitled The American starring George Clooney. The scenery was spectacular and worth the watch.